Edition #5 of the Earthgauge News podcast for the week of Nov. 5, 2017. Hundreds of sea turtles have been found dead off the coast of El Salvador. Thanks to a fellowship from the Institute for Journalism and Natural Resources, I was able to join a group of journalists on a learning expedition in Michigan last year. 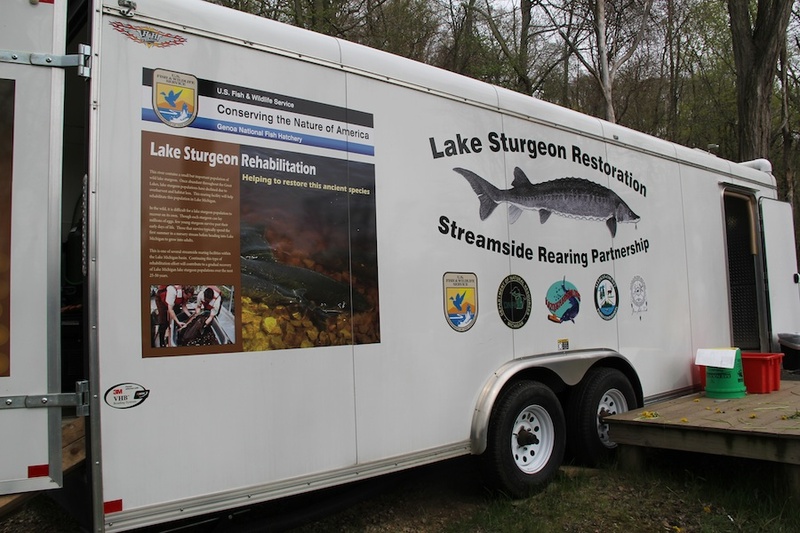 One of the projects we investigated was the effort underway to rehabilitate lake sturgeon populations in the state. I produced a short audio documentary for the Great Lakes Echo about this program. Back in the late 1800s, lake sturgeon ranged widely throughout the Mississippi River, the Great Lakes and the Hudson River. The Lake Michigan region is in the centre of the sturgeon’s historic range. Populations in and around the state were estimated to number in the hundreds of thousands. However, sturgeon were considered a nuisance by commercial fishermen because they destroyed fishing gear that was set to target other species. This led to their widespread slaughter and, since the mid-nineteenth century, exploitation and habitat degradation have resulted in a substantial decline in sturgeon populations. Only a remnant of the original lake sturgeon population remains in most Great Lakes areas today, including that of Lake Michigan. The fish is now listed as a threatened species by the Michigan Department of Natural Resources and numerous management efforts are being undertaken to try to protect the fish and ultimately restore healthy sturgeon populations. One of these initiatives is a streamside rearing program operated by the Michigan Department of Natural Resources. During the IJNR trip, we visited the rearing program at the Allegan County Park in New Richmond on the Kalamazoo River. I was fortunate to participate on the Students on Ice 2013 Arctic Expedition this year, which was a tremendous experience. We traveled up the west coast of Greenland by ship and across the Davis Strait to the Eastern Canadian Arctic. I produced a short audio documentary based on the experiences of two of the students on the journey and it aired on CBC Ottawa Morning on Monday, July 29. Click the audio player above to check it out or right click here to download! On Earthgauge Radio this week, Xerez Bridglall will bring us her interview with two Carleton University undergraduate students who participated in the Alternative Spring Break (ASB) program this year. ASB is an immersive year-long program that culminates with a week of cultural exchange and community service over reading week in February. Mario Pizzuto and Megan Stacey went on the ASB trip to Guatemala where they were involved in building a structure made out of eco-bricks, an environmentally friendly, additive free pressed kiln dried hardwood sawdust bricks used for home heating fuel in wood burning stoves, wood burning fireplaces and outdoor fire pits. Also on the show, I’ll be speaking with James Keena of Ontario Home Comfort. OHC offers ways for homeowners to upgrade to more energy efficient appliances such as furnaces and hot water tanks, which can save you hundreds of dollars every year in energy costs and reduce your environmental footprint. You may even be eligible for additional government and Ontario Power Authority rebates. We’ll find out more about this great program in my interview with James. Finally, given that 2012 was the 50th anniversary of the groundbreaking book ‘Silent Spring‘ by Rachel Carson, a book that many believe launched the environmental movement in the 1960s, we’ll feature a Democracy Now! interview with renowned author and environmental health activist Sandra Steingraber who reflects on the significant impact the book has had over the years. To kick off the program this week, I speak with Andrew Van Iterson who is the manager of the Green Budget Coalition. Environmental funding in last week’s 2013 federal budget had very little in the way of environmental provisions. Sustainable Development Technology Canada, a government-funded venture capital firm that invests in environmental technology firms, will get $325 million over eight years and there is some funding for municipal projects, notably the City of Ottawa’s new wastewater holding tanks. But the green measures are pretty slim beyond that. The Green Budget Coalition, founded in 1999, brings together sixteen leading Canadian environmental and conservation organizations, which collectively represent over 600,000 Canadians, through our volunteers, members and supporters. They make an annual set of recommendations to the federal government regarding strategic fiscal and budgetary opportunities. Next up Earthgauge contributor Juanita Bawagan speaks with Glennys Egan who is a Masters student in the African Studies program at Carleton whose research is based on issues of urbanization in Kenya. She has recently been in Kenya working with a community organization through Street Kids International based in a Nairobi slum and she tells Juanita about her research and experiences there, and the environmental and human impacts of urbanization in Kenya. In the second half hour, I speak with Brendan Haley who is a PhD student at Carleton’s School of Public Policy and Administration and a fellow of the Broadbent Institute. He co-authored a recent study called ‘The Bitumen Cliff’ warning that the poorly regulated bitumen industry is creating a double threat to Canada: a so-called “staples trap,” with an economy over-reliant on bitumen exports, and a “carbon trap,” locking Canada into fossil fuels instead of adapting to climate change. The report was co-authored by the Canadian Centre for Policy Alternatives and the Polaris Institute.